And this is one of the very best old DCS intros imho. Too bad we don't see these kinds of well designed one screen prods nowadays.. Seems simple at first, but brings together a perfect design and a perfect tune! This and Sonic Attack are my DCS favos. Greetings from back in the days. Yes, I really liked this one when it first came out. Cool logo by Iridon. rulez added on the 2009-02-14 17:04:43 by ɧ4ɾɗվ. a cold and windy autumn day...i could need some more CDCs...i should consider watching/rating prods i have missed so far maybe ! still this one rulez ! just for its idea of sth never been done before, also i like the implementation including the shadows, alltho they´re just added to the color of the vector-planes, which is easy at all, just looks superb this way tho ! added on the 2009-10-18 01:46:50 by ɧ4ɾɗվ. 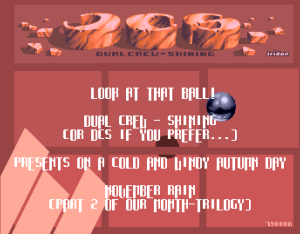 a really nice intro, 1993 Amiga style FTW! Great music, very good logo and really nice design! page created in 0.017947 seconds with 15 queries.